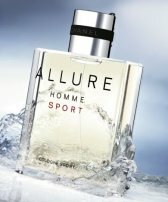 This month, Chanel will launch a new variation on 2004's Allure Homme Sport: Allure Homme Sport Cologne Sport. The new fragrance for men, by Chanel in-house perfumer Jacques Polge, will be lighter and fresher than the original, and will be advertised under the tag line "a sensation doesn’t need to be aggressive to be strong". Other recent releases from Chanel: Chance Eau Fraiche & Les Exclusifs de Chanel. Has anyone else tried the new Allure Homme Edition Blanche? It's an eau de toilette concentree. – An explosive freshness that comes from the combination of citrus fruits (Lemon and Bergamot). – An incredibly creamy oriental note, carried by the Sandalwood Note, Haitian Vetiver and Vanilla from Madagascar. These two different tones intermingle to create an explosive alchemy of hot and cold – characteristic of the unique nature of the fragrance.